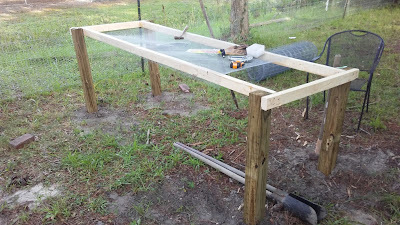 Adam, my farmer hero, sacrificed much time and labor and built a new pen and coop for my four new chickens. They're about 7 weeks old now. The pen/yard is right beside the garage. 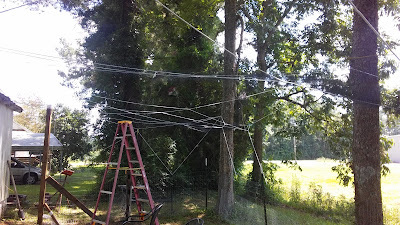 He put up fencing: 4x2 welded wire, chicken wire on the bottom, and netting overhead and down the sides. He used existing trees and put in posts. He strung rope overhead to hold the netting. 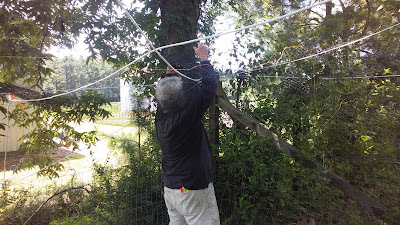 The netting is to prevent the birds from flying out, which is how we lost several hens before. It was tedious work, but he never complained. 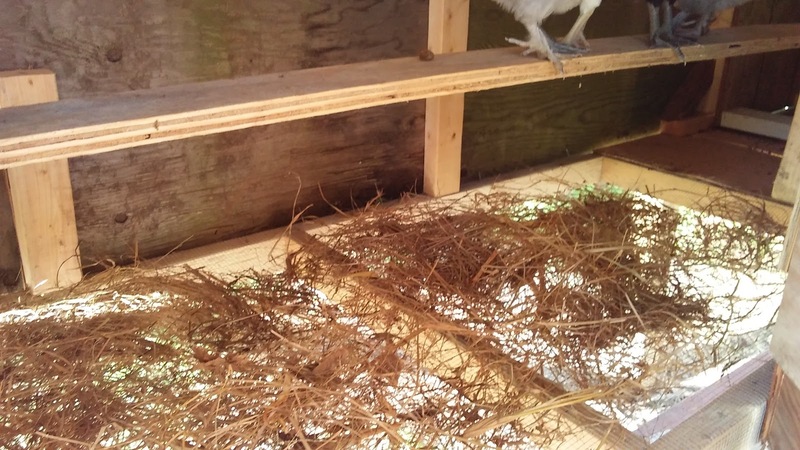 After the enclosure was mostly finished, he started on the coop. 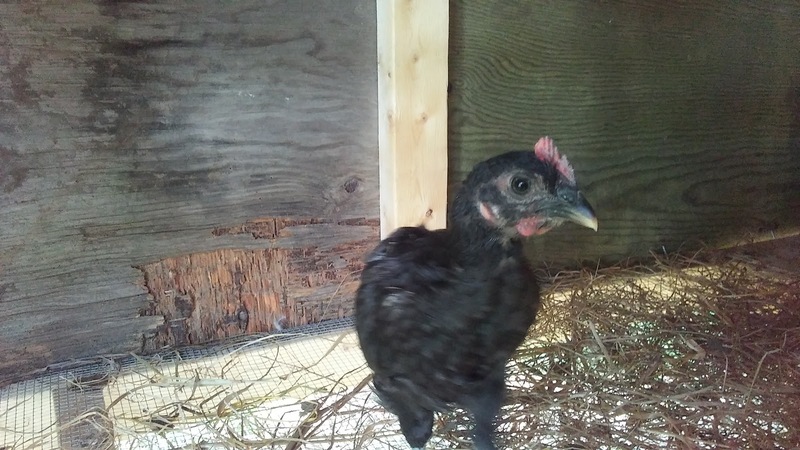 I hinted to him that the babies were feeling quite confined in their dog kennel on the front porch, and were starting to fight a bit. 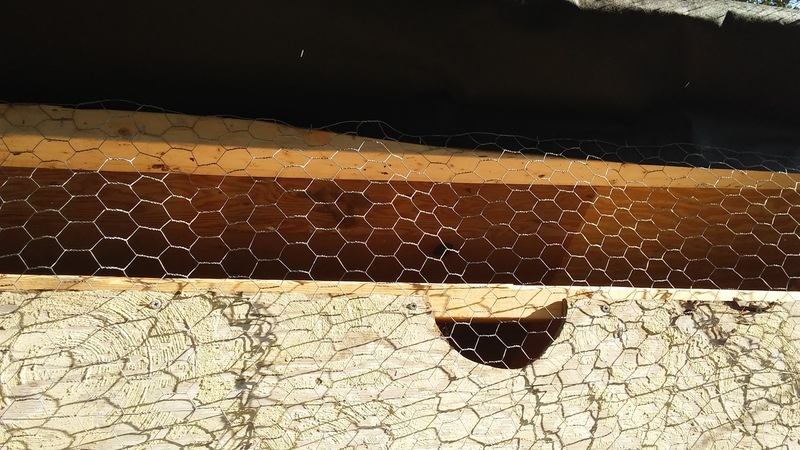 He built the frame of new materials, digging post holes and putting hardware cloth (a fine wire mesh) as the floor of the coop. 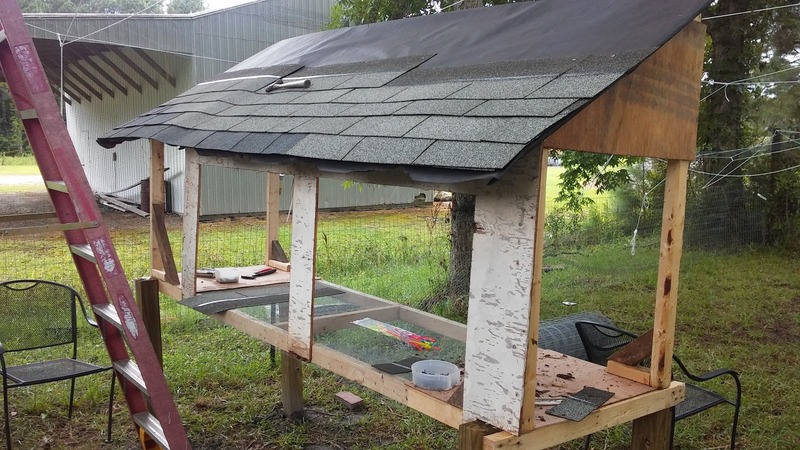 He built a sloped roof. 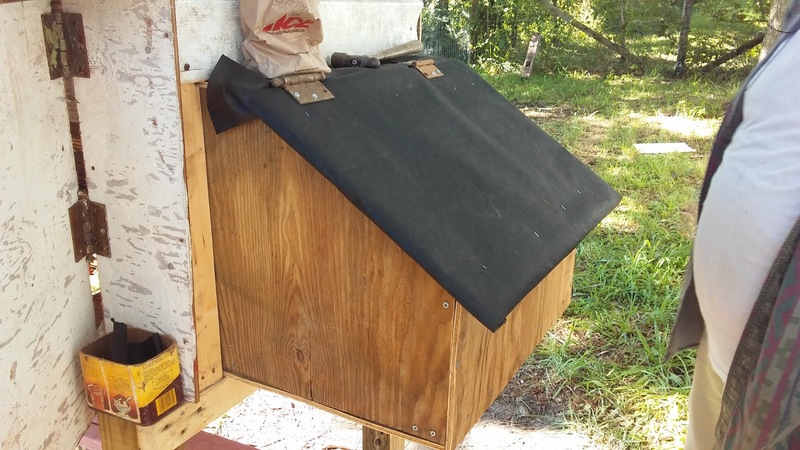 Friends had given us some asphalt shingles and tar paper, which was a very timely gift! Adam used old farm wood for the exterior walls. 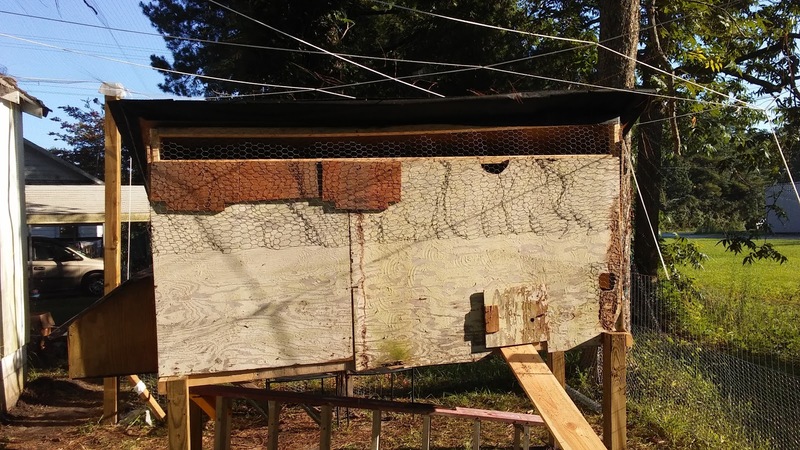 It is not meant to look fine and swanky like some chicken coops. It is meant to be sturdy, serviceable, and inexpensive. He built a fine nesting/laying box to go on the left hand end of the coop. 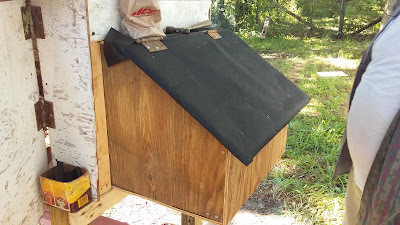 I can lift that lid and get eggs out easily ... provided the hens decide to lay there and not elsewhere! This is the front side. See the laying box on the left? 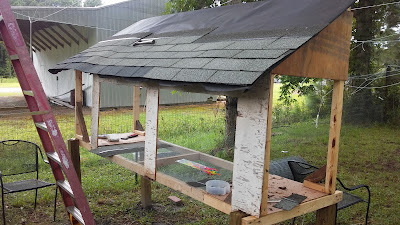 The exterior is a bit pieced together, but it's solid. 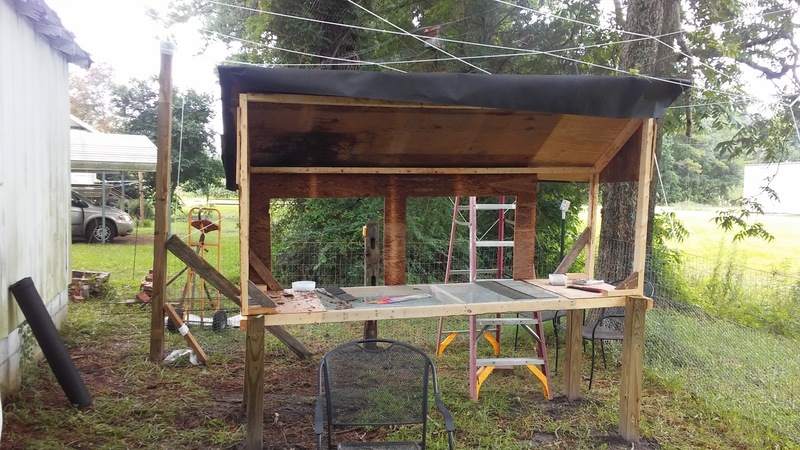 He cut out a little hinged door for them. 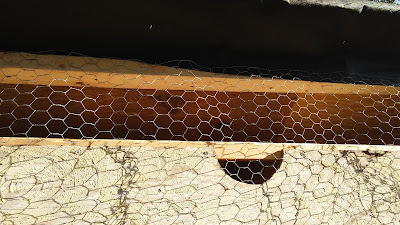 I lifted the laying box lid and took some inside shots. They really like their sturdy, wide roost. They seem very happy and content in there. The screen floor, plus lots of open screening under the roof eave, gives good ventilation. 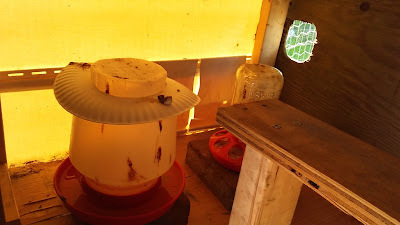 They have food and water inside. 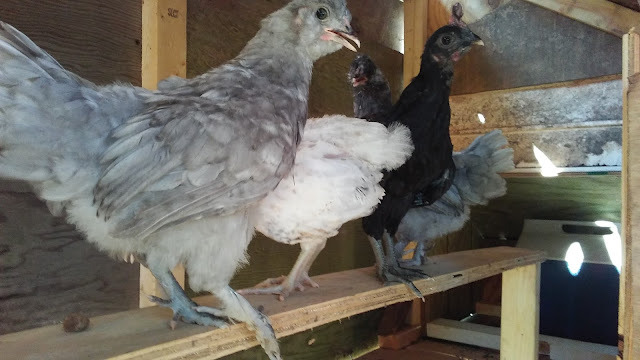 I put that paper plate on top of their waterer because they kept perching on top of it and pooping, and their poop would drop into the water tray! Ugh. As you see, this helps a bit. This is the view from the house, and you see Adam put a door up too, with a latch. That's the door from the greenhouse. The wind out there really thrashed it, so we hope it will have a calmer life here out of harm's way. Okay, here are my babies. This is Inky. Unknown breed. 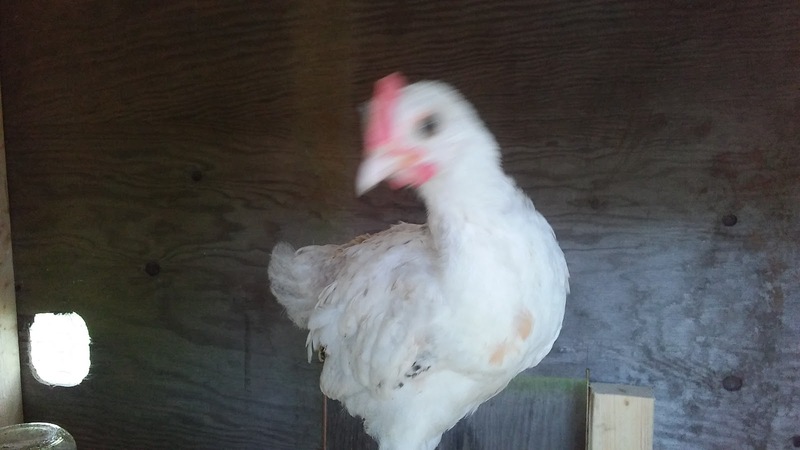 Hoping she's a hen, but with wattles developing, she may be a roo :( She is my sweetest, and will let me pick her up easily. This silkie cross is called Little Gray. 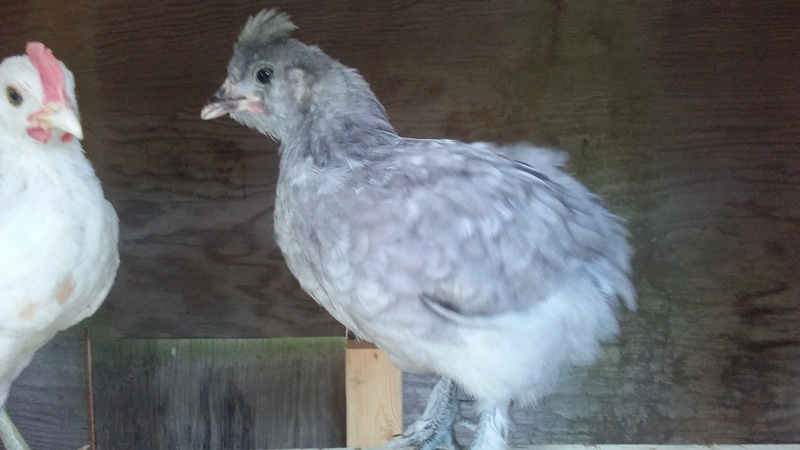 Her head feathers are a real tuft up there, so I'm hoping she's a hen. 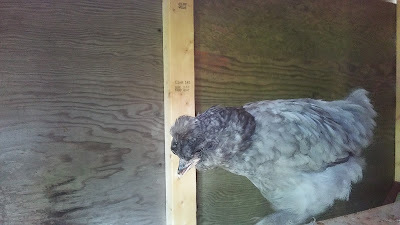 You just can't tell with silkies until they crow or lay an egg, from what I've heard. This is my other silkie cross, Sylvie. Not sure about her gender either. Fourth chick, unknown breed. Smallest, but most aggressive, perky, and inquisitive. Bright pink/red comb and wattles and perhaps hackle feathers tell me he's probably a roo. I don't mind one roo in this bunch, but I don't want two. 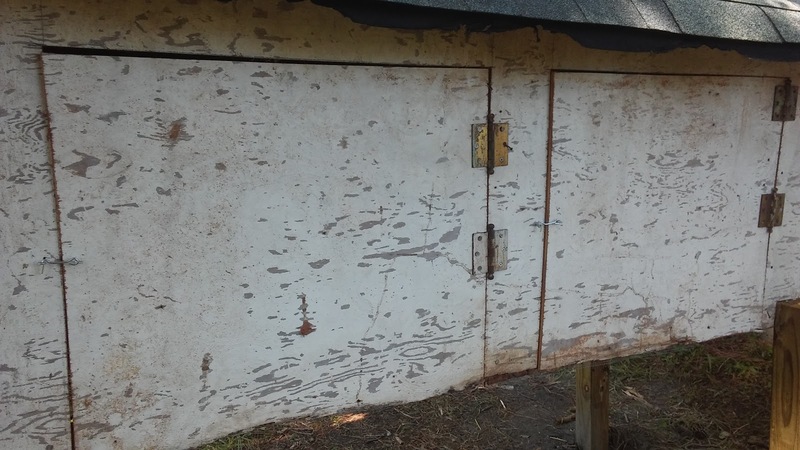 Adam put two large hinged doors on the back side of the coop so I can clean it out easily and get the birds out by hand if I need to, plus for changing food/water. 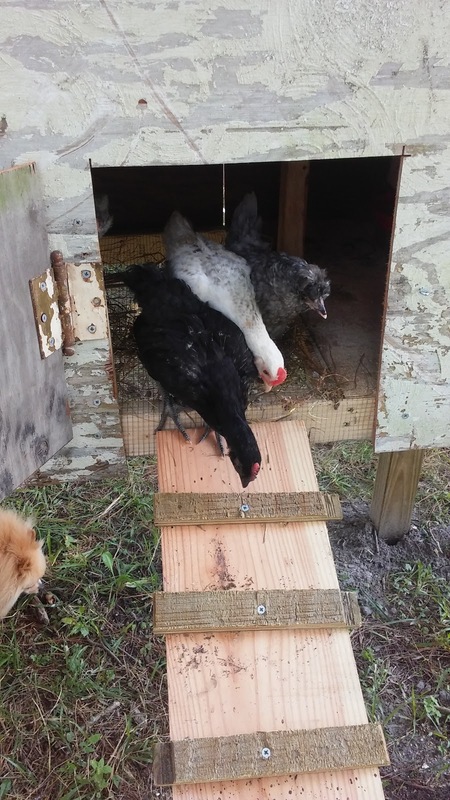 Their poop should dry and fall through the hardware cloth, a feature of this coop I'm quite fond of! The wood you see there is pretty pitiful-looking! It started life as the ceiling in the girls' building. Then it served as the walls of Adam's compost bins for 2 years. 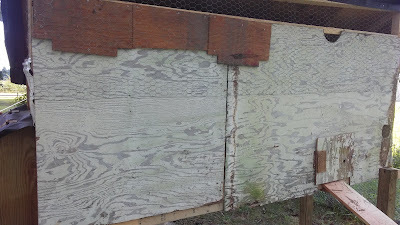 (Thus the decay along the bottom edge) Now it's a chicken coop. That's what we mean by reuse and save money! 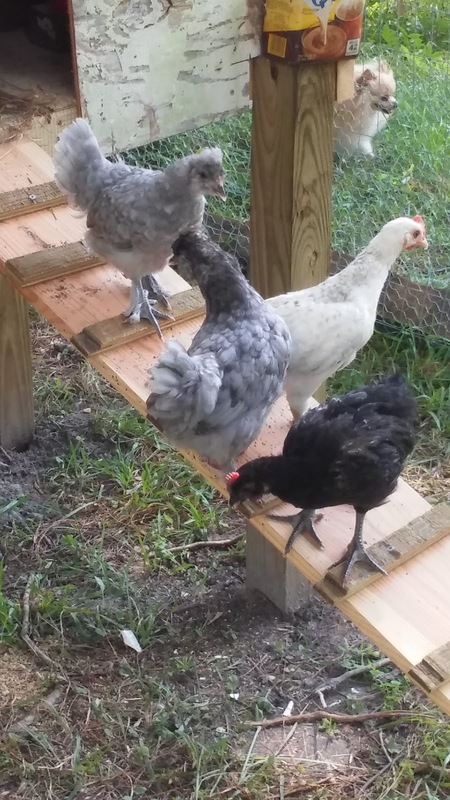 Then they came hurrying down their chicken stairs to enjoy the big world! They pecked and ate grass and weeds with great enthusiasm! They scuffled in the dirt and took dirt baths, lying together in a pile. The chipped and ran around and fluttered. They are adorable. Oh, I hope I don't end up with four roosters!!! They also must learn to re-enter the coop in early evening. I picked each one up and put it inside, walking each one up the stairs a bit to help them learn. Today, Sylvie didn't want me to pick her up At All. Finally I walked to the stairs and tapped my fingers on it several times. She came over, and flew up onto the stairs! (Yay!!! Success!!) I opened the door, and she went inside. Oh, I hope they learn to do that themselves! This is what we've been doing with much of our time the past week -- making a home for baby chickens we may or may not be able to keep, depending on their genders. Ah well. But we are satisfied with the new coop and pen, and hope this will make for a safer flock. Recycling is a great way to live and enjoy life. 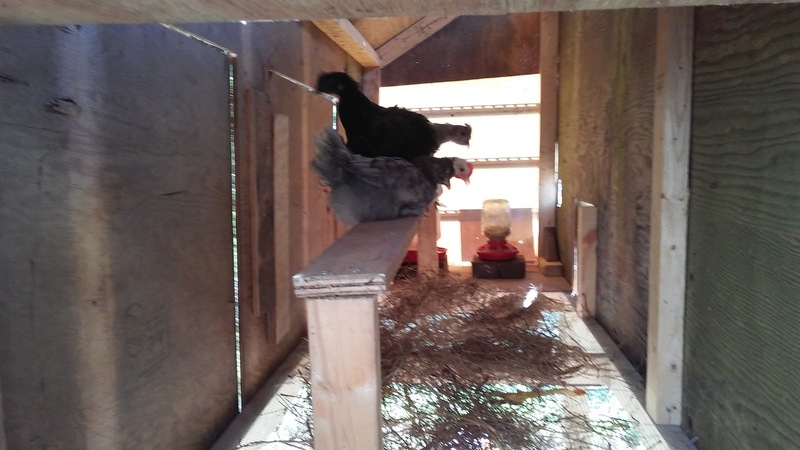 Your chickens look like they are making themselves right at home. Great job with the chicken pen. They sure look like they like their home. I hope you don't end up with four roosters either! It's always a concern, LOL. 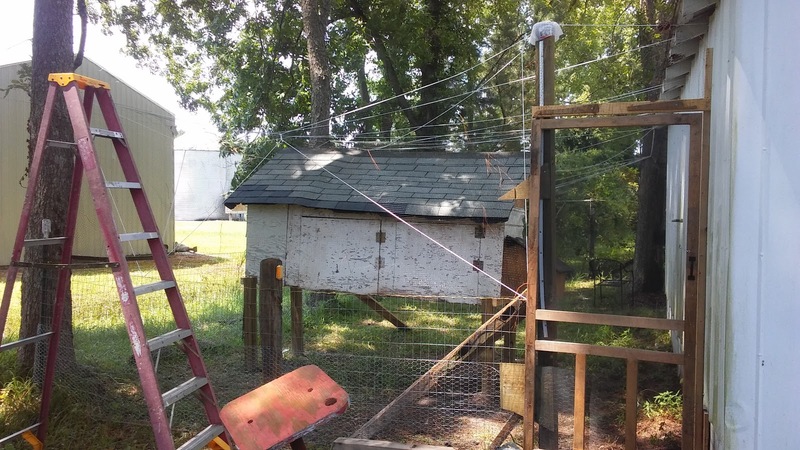 Excellent job on the coop! 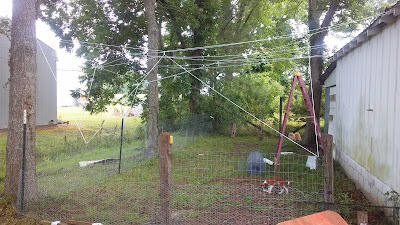 And I like that you've covered your chicken yard. Flying chickens can be a nuisance, plus the netting will keep things out (like hawks if you have them.) You are going to have some happy chickens on your hands.